A controversial new logo for the new Cornwall Council has been scrapped. 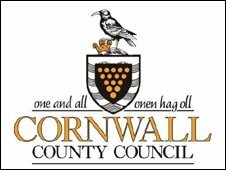 The symbol for the authority will be Cornwall County Council's current logo, an implementation committee said. More than 10,000 people had signed a petition against the new logo, which was compared by critics to the hairstyle of boxing promoter Don King. The Implementation Committee for One Cornwall unanimously decided to ditch the new design and stick with the old one. It followed months of complaints over the new logo, which local people said did not reflect Cornwall's history and environment. The insignia was chosen from more than 30 options designed by council staff at cost of about £7,000. It would have cost £476,000 to roll out the chosen emblem and put it on council stationery, vehicles, signs, ID badges, staff uniforms and websites. The decision means the county's logo will continue to feature a chough, a type of bird included in some legends about the county. However, the decision means that, although the crest will remain, the wording will be changed to remove the word "county" from the emblem. David Whalley, leader of the current Cornwall County Council and chairman of the new authority implementation executive, said the committee appreciated that some members of the public were unhappy with the design. He said: "As a result, we have decided to continue to use the logo which has been associated with Cornwall County Council. "This celebrates the county's heritage at the same time as marking the change to the new Cornwall Council". The new council will replace the six district councils and county council.